When it comes to restaurants, the area of Trastevere can be a bit of a minefield – thanks to its picture-perfect streets it attracts a lot of tourists, meaning eating there can be hit or miss. Whilst I usually stick to a few tried-and-tested places, sometimes I mix it up and take a chance on somewhere new – which was how I discovered Pasta e Vino Osteria. Pasta e Vino first came to my attention when I noticed that it had a five star rating on Tripadvisor, even after more than 1,200 reviews! It specialises, as you might expect with the name, in pasta – the menu offers the chance to choose your type of pasta (all handmade in house) and the sauce to go with it. The prices are really reasonable all between €8 – €10. 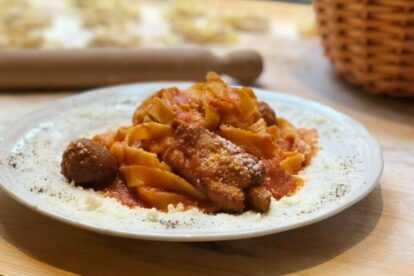 I chose something I’d never had before, strozzapreti (small curls of pasta) with ‘le spuntatura e salsiccia’ – a thick tomato-y sauce with spare ribs and sausage. It’s something a bit different, not being one of the classic ‘Roman’ dishes that are served everywhere across Trastevere – and it was absolutely delicious, one of the best pasta dishes I’ve tried in Rome. The restaurant itself is cosy, with an upstairs and downstairs, with friendly staff and good prices. Booking is recommended, but if you forget they’ll serve you a free glass of red wine whilst you wait!